The following serves as a general set of recommendations and guidelines for fitness walking as a form of exercise. Walking is a popular and simple form of exercise, often considered ideal because it does not carry the same limitations as others. It can be done nearly anywhere, anytime, and without the need for equipment, special skills, or excessive expense. In addition, it can be one of the safest, with a relatively low incidence of injury when simple care is taken. If you are suffering from a serious medical condition, it is important to discuss with your physician what particular precautions you need to take. While a special exercise machine or similar device is not required for fitness walking, most experts agree that comfortable, supportive, athletic-type shoes produce the lowest risk of injury and discomfort. It is equally important to dress in comfortable clothing that allow for sweat to evaporate - key to cooling while exercising - layering if you need to adjust to the temperature. Warming up, the process of preparing your muscles for physical activity, reduces your risk of injury. A typical warm-up usually includes jogging in place or shaking out your limbs for 5-10 minutes. After warming up, it is best to stretch for about five minutes, concentrating on the muscles that will be involved in walking. These include calves, quadriceps (thighs), hamstrings, and lower back. If you are already involved in regular exercise, there may be little if any adjustment involved in taking on a walking program. However, if you have been sedentary of late or limited by a medical condition, it is best to start gradually - in both pace and time. If the goal is to burn fat, manage a medical condition, or even just engage in a healthy activity, walking should be aerobic - meaning the muscles have sufficient oxygen. This requires a minimum goal of 20 minutes each session, as well as regular, easy breathing throughout. 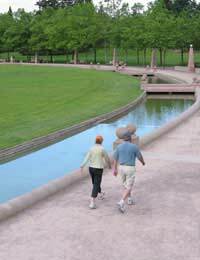 Start by walking about ¼-½ mile - or less - depending on your current physical condition and personal risks. Walk only as fast as is comfortable, meaning without becoming winded. Walk only as long as is comfortable, meaning you do not want to "drop" during or even after. For some this may mean anywhere from 5-15 minutes per session, twice a week at first. Depending on your abilities, you may reach 30 minutes of walking 4-5 days per week within one week to a month. Increases beyond this may progress more quickly as the condition of your body improves. At least 30 minutes per day, three times per week at a speed of 3-4 miles per hour has been shown to result in increased fitness. Most experts consider an optimal goal to be approximately 45-60 minutes five or more times per week. An entire hour of activity need not be completed at once - dividing the workout into 2-3 sessions of 20-30 minutes each also provides great benefit. To reduce stress on your heart, complete each walking session with a cooling down period of an additional 5-10 minutes. Stretch out the muscles you used, also for about 3-5 minutes. Fluid loss is affected by exercise intensity as well as temperature, and needs to be compensated during activity. The average person requires about 6-8 cups per day of fluids, and light physical exertion may increase this to 10 or more, depending on conditions. Note that major losses due to perspiration include not only water, but also electrolytes, and these need to be replaced as well. Heart rate is a standard measure of exertion, and can direct safe increases in workout intensity. It can be measured either via a monitor or by checking your pulse manually for 10 seconds, then multiplying by six. Your maximum heart rate - generally 220 minus your age - should never be exceeded.